Uluru Kata Tjuta National Park is a World Heritage Area listed for both it’s natural and cultural values, yet many living outside Australia still only know it by its European name – Ayers Rock. Here, even during a brief stay of only a few days, visitors can and do experience a profound sense of being in a sacred place. For the Anangu, traditional owners of Uluru, and for others who are fortunate enough to live in its presence, and who choose to dwell there in a receptive manner, it can be a place for deepening awareness of the manta – the Earth, as sacred. 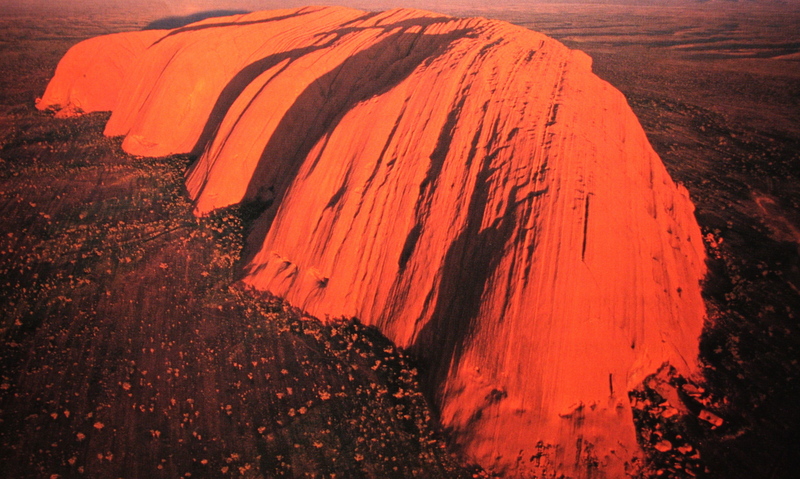 Most of Uluru’s quartz-like mass is buried to a depth of almost 6 kilometres beneath the surface of the desert. It’s awesome above ground appearance presents less than one percent of its total mass, but is nevertheless unlike any other natural feature throughout the vast landscape of Central Australia. Located about 400 kilometres South West of Alice Springs in the Northern Territory, it is not an easy place to get to. From any major Australian city it requires either several days travel by road, or a flight is usual via Alice Springs, then onto the Yulara tourist resort situated just 30 kilometres from the great monolith. I was fortunate enough to be one of those piranpa – non-Anangu, ‘whitefellas’ – who got to live at Mititjulu, a community that emerged in response to Uluru’s growing popularity as a tourist attraction. As an employee of the Australian National Parks and Wildlife Service I lived close enough to be able to see Uluru from our kitchen window and I drove alongside it to work most mornings for about five years. I lost count of the number of times I climbed Uluru in the course of my work. On one occasion I climbed it during the light of a full moon, looking for so called ‘new age’ trespassers, but I soon lost any desire of meeting let alone apprehending trespassers: being on top of Uluru that night was as close as I could imagine to actually walking on the moon itself. On other occasions, as part of a rescue training program, I landed on and took off from a helipad on top of Uluru, and once I accepted an invitation to fly with the camera crew that filmed a Qantas promotion, wherein one of their commercial passenger jets does a tight and dramatic turn over the top of Uluru. These were amazing and unusual interactions for anyone to have with Australia’s most popular icon. One evening while on what we called the sunset patrol, I had a most exhilarating interaction with another species. The last tourist had long since reached the bottom of ‘the climb’ and I was alone on top of Uluru watching Sun slowly disappear behind Kata Tjuta – ‘The Olgas’ as they are named by Europeans, about 30 kilometres to the West. I first heard the flapping of its wings, then a few seconds later it took my breath away and my knees began to shake. I was being circled and focused on by the greatest of Central Australia’s hunters walawuru – the wedge tailed eagle. It had swept up from a gorge behind me and as it circled directly above me it came close enough for me to see the brown of it’s eyes. I dropped onto my knees as if wanting to worship such an awesome creature, but it was more a case of deep respect, as well as awe and a tinge of fear. I also felt that being in walawuru’s domain after sunset was not what the great eagle wanted. Some months later a similiar interaction took place between walawuru and I. On this occasion I was sitting, again alone at the top of Uluru and watching Sun going down over the horizon – Earth turning: walawuru circled, without moving in for closer scrutiny, and this time I didn’t feel unwelcome – it felt like an amicable interaction. These walawuru and other airborne Uluru experiences were for me, doorways into gaining a far more embodied and profound consciousness of the other-than-human. There was also an opening to a particular cave at the base of Uluru wherein much awaited me: a remembering of my childhood ways of knowing and being – a remembering of the sense that everything belonged to me and anything was possible. I found there what I called my ‘Selfplace’. Nowadays I reflect on that time and space as my desert pilgrimage, the beginning of a new way of relating to other and all- that-is. These ritualised return visits to Uluru in general, and to my chosen cave in particular, were the beginning of a lengthy and intense process of remembering how to listen to the manta – to Earth, and it is where I found my ‘Story Stone’, Ngayulu puli tjukur(pa). This was decades after my Welsh mother Dilys first introduced me to stone consciousness using fossils on Penarth beach – my favourite childhood playground. I received my Story Stone as an act of generosity from the subtle realms of a cosmic consciousness. I share this story in the belief that the first act of ngapartji-ngapartji (Pitjantjatjara for ‘a deep reciprocity’) is that of receiving. The dawn and sunset are moments when the numinous source of all existence is experienced with special sensitivity. …Living things come into being, flourish then fade from the scene. This ever-renewing sequence of sunrise and sunset, of seasonal succession, constitutes a pattern of life, a great liturgy, a celebration of existence. …Such sensitivity to the powers of the universe resulted from the experience of the benign and fearsome forces surrounding the human community. …This sense of a benign universe found expression in the Navaho expression to ‘go in beauty’. My Story Stone and the tjukurpa – religious philosophy, of Central Australia opened new ways of knowing and being for me. It continues to be a great source of wisdom and guidance for me and my beloved Glenys as we deepen into our ‘PaGaian Cosmology’, a new and homely Earth-based Goddess religion. a generous diversity in their outward patterns from group to group, and from person to person. More importantly, the very nature of the religious beliefs prevented the rise of that particular kind of religious fanaticism which could have swept a small, but well organised body of men into a position of authoritarian power over a large community. This is the time of Spring’s return … The story of Old tells us that Persephone beloved daughter, returns from Her journey to the underworld. Demeter stretches out her arms – to receive and rejoice. The beloved One, the Lost One, returns with new Wisdom from the depths. Thomas Berry, The Great Work , p. 177-78. T.G.H. Strehlow, Central Australian Religion , p. 47. Glenys Livingstone, PaGaian Cosmology: Re-inventing Earth-based Goddess Religion , p.210. Taffy Seaborne is a former manager of Uluru (Ayers Rock) National Park, Australia’s most popular Indigenous icon. He now lives with his partner Glenys Livingstone in the Blue Mountains west of Sydney where they hold a sacred space – and have built MoonCourt – for celebrating the seasonal wheel of the year as it unfolds in the Southern Hemisphere. What a wonderful story Taffy and Glenys. Full of inspiration in the most grounding way! Thanks for sharing this, i may even repost it, i enjoyed it so much.